What Elements Make Up Glucose? Life on Earth only exists thanks to a class of organic compounds called nucleic acids. This classification of compounds consists of polymers constructed from nucleotides. Among the best-known nucleic acids include DNA (deoxyribonucleic acid) and RNA (ribonucleic acid). DNA provides the blueprint of life in living cells whereas RNA allows the translation of the genetic code into proteins, which make up the cellular components of life. Each nucleotide in a nucleic acid consists of a sugar molecule (ribose in RNA and deoxyribose in DNA) to a nitrogenous base and a phosphate group. The phosphate groups allow the nucleotides to link together, creating the sugar-phosphate backbone of the nucleic acid while the nitrogenous bases provide the letters of the genetic alphabet. These components of nucleic acids are constructed from five elements: carbon, hydrogen, oxygen, nitrogen, and phosphorous. In many ways, life on Earth requires compounds called nucleic acids, complex arrangements of carbon, hydrogen, oxygen, nitrogen, and phosphorous that act as the blue prints, and blue print readers, of an organisms genetics. As an organic molecule, carbon acts as a key element of nucleic acids. Carbon atoms appear in the sugar of the nucleic acid backbone, and the nitrogenous bases. Oxygen atoms appear in the nitrogenous bases, sugar, and phosphates of the nucleotides. An important difference between DNA and RNA lies in the structure of their respective sugars. Attached to the carbon-oxygen ring structure of ribose lie four hydroxyl (OH) groups. In deoxyribose, one hydrogen replaces one hydroxyl group. This difference in an oxygen atom leads to the term “deoxy” in deoxyribose. Hydrogen atoms lie attached to carbon and oxygen atoms within the sugar and nitrogenous bases of nucleic acids. 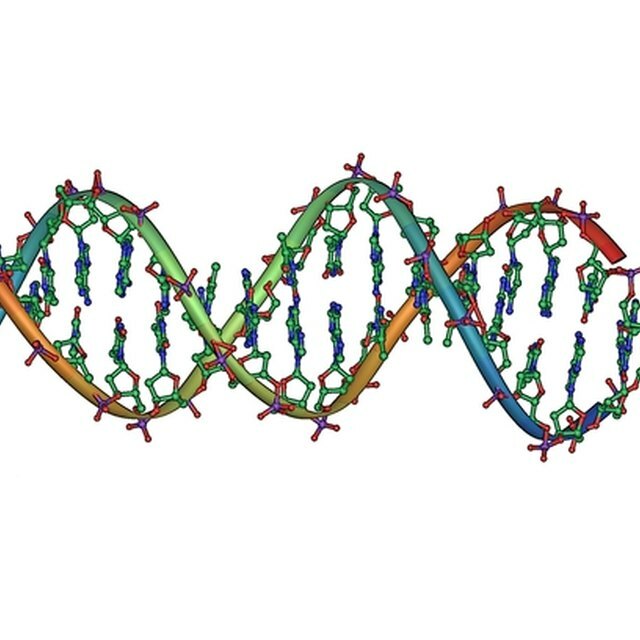 The polar bonds created by hydrogen-nitrogen bonds in the nitrogenous bases allow hydrogen bonds to form between strands of nucleic acids, which results in the creation of double-stranded DNA, where two strands of DNA are held together by the hydrogen bonds of the base pairs. In DNA these base pairs align with adenine to thymine and guanine to cytosine. This base pairing plays an important role in both the replication and translation of the DNA. The nitrogen-containing bases of nucleic acids appear as pyrimidines and purines. Pyrimidines, single-ring structures with nitrogen located at the first and third positions of the ring, include cytosine and thymine, in the case of DNA. Uracil substitutes for thymine in RNA. Purines have a double-ring structure, in which a pyrimidine ring joins to a second ring at the fourth and fifth carbon atoms to a ring known as an imidazole ring. This second ring contains additional nitrogen atoms at the seventh and ninth positions. Adenine and guanine are the purine bases found in DNA. Adenine, cytosine, and guanine have an additional amino group (containing nitrogen) attached to the ring structure. These attached amino groups are involved in the hydrogen bonds formed between base pairs of different nucleic acid strands. Attached to each sugar is a phosphate group composed of phosphorous and oxygen. This phosphate allows the sugar molecules of different nucleotides to be linked together in a polymer chain. What Is an Olefin in Chemistry? Chandler, David. "Elements of Nucleic Acids." Sciencing, https://sciencing.com/elements-nucleic-acids-5974918.html. 20 May 2018.